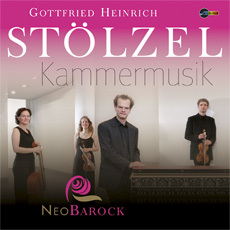 NeoBarock releases the world premiere recording of chamber music by the master of court music at Gotha, Gottfried Heinrich Stölzel. The secret laws deciding whether an artist becomes famous after his lifetime or just fades away will always remain a mystery. Gottfried Heinrich Stölzel, one of the most important and well-known musicians of his time became master of the court music in Gotha in 1719 after visits to Italy and various European courts. Over a period of 30 years up until his death in 1749 he brought the court music there to new heights. The reason for Stölzel not being mentioned in the same breath as Bach or Handel is mainly due to our lack of knowledge about him. Many of his compositions have been lost, while the rest have been strewn around diverse libraries and only survive as copies. The chamber music ensemble Neobarock has quickly acquired a reputation for being an excellent interpreter of unusual programmes. In their well-received recordings of Bach and his contemporaries they have been named the „stylistically knowledgeable advocate of this repertoire” (Fono Forum). They have yet again gone on a journey of discovery to unveil the most beautiful chamber music compositions by the genius from Gotha and present them in this world premiere recording.